It’s been six weeks since Torre was born, and I am starting to feel like I have my body back. I was surprised at how weak I felt in the weeks after delivery since I had carried this baby for nine months and pushed him out over the course of a whole day. I expected to have built up strength, not lost it! Well, it turns out that pushing a stroller through slush and lifting an ever-growing baby repeatedly through the day builds more strength than pregnancy does, and my stamina is improving simply through the rigours of daily life. Six weeks postpartum is generally the earliest time that women are suggested to resume exercise, and I would be really happy to find a routine that works for me in the new realities of my life. Previously I have loved doing kickboxing, and I almost kind of got into running for a few months before becoming pregnant, but we have no money for a gym membership, and I don’t have the willpower to rebuild my cardio endurance up from nothing. Enter fit2b.us, a website that streams fitness videos members can access for $10/month. I learned about this site when my friend Beth ran a giveaway for three months’ membership while I was still pregnant. I didn’t win the giveaway, but I did learn a lot about diastasis recti and that it might not automatically correct itself after my baby was born. Sure enough, six weeks after losing my bump, there is still a slight gap in my abs. You wouldn’t know it to look at me – I’m back in my pre-pregnancy clothes and have the strength I need to lift, carry and bend. Mostly. But Torre is still small, and there are already days I feel my body struggling to keep up. I don’t want to make things worse by doing the wrong kind of exercise, and I don’t want to risk complications in future pregnancies or more serious injury by leaving my core to its own devices. So I’m signing up! My plan is to try this site for 3 months and then evaluate whether my core strength and overall fitness are improving. Maybe I’ll continue from there, or maybe this will just be a transitional thing, but I’m excited to see how it goes. I’m also excited because if you care to join me in this fitness experiment, you can get a free month and make me some money too! 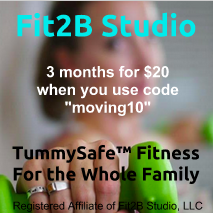 If you sign up, enter “moving10″ as the discount code and receive three months of membership for $20 instead of $30! Not only will you save $10, but I will get $5 for referring you. If you have been, are currently, or think you might ever become pregnant, I think it would be a huge benefit (even if your pregnancy was ages ago ), but there is something for everyone and all fitness levels. I am excited to jump in and explore and will let you know how things go!